Are You Paying More For Rosuvastatin (Generic Crestor) Than Brand Name Crestor? The skeptical cardiologist was shocked to hear from a patient last week that she would have to pay considerably more for generic rosuvastatin (GR) than Crestor, its brand name equivalent. Crestor is the most potent statin we have at lowering LDL (bad) cholesterol, raising HDL (good) cholesterol, and preventing strokes and heart attacks. It is also the best tolerated statin in my experience; I use it frequently at low or intermittent dosages in patients who have developed muscle aches on other statins. In comparison to atorvastatin (Lipitor, the most widely prescribed statin), Crestor is less likely to interact with other medications and (very important for a surprising number of my patients), you can consume grapefruit when taking it. 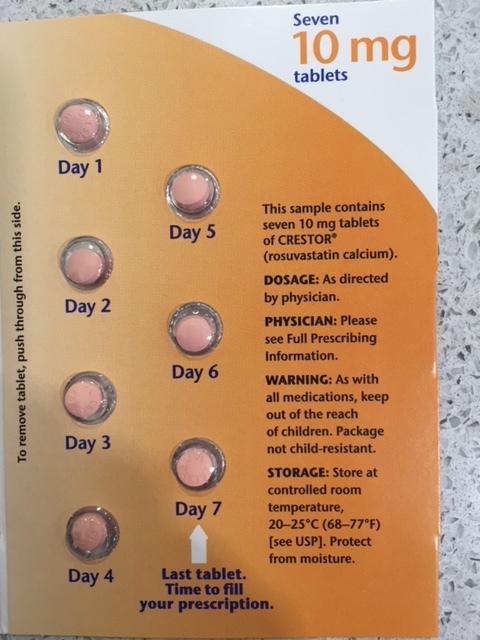 When a generic (rosuvastatin calcium) of Crestor became available last year I rejoiced, believing that the high cost of Crestor would now drop to the levels we have typically seen with other generic statins. I have been giving Crestor sample packs like these to my patients for years. Alas, they will fade away. One downside to going generic. For example, when Lipitor (atorvastatin, the statin market leader for 20 years) went generic, patients no longer worried about its cost. Initially it seemed GR was much more affordable for my patients than Crestor, however recently, I have had many of them report a rise in its cost. Why Would The Generic Cost More Than Crestor? The reasons for brand name versus generic pricing are many and complex, and they yield insight into the legal machinations that Big Pharma engages in to maintain high patient pharmaceutical costs. What an individual pays for drugs varies wildly depending on their insurance coverage. These costs are extremely hard for a physician to anticipate and rarely reflect the actual cost of drugs. Thus, in America, patients as consumers are often isolated from the true costs of pharmaceuticals to society. I did not pay anything for the 25 pills, however the paperwork states a cost of $220 if I had to buy this outside of a health insurance plan. Do you know if the health insurance company is being charged the $220, or do they negotiate a lower cost with the manufacturer? I don’t have that answer, but would love to know it. This kind of information is hard to get at. I would like to get input from my patients and readers on their experience regarding the cost of GR to them and/or their insurance company. I’d also appreciate input from those in the pharmaceutical or insurance portion of this equation (I know I have at least one patient who is in the pharmaceutical industry).